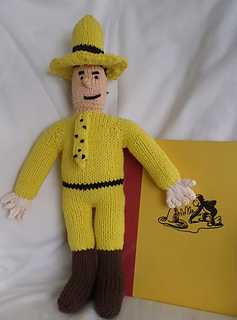 The Man with the Yellow Hat is approximately 18” (45.5 cm) tall. 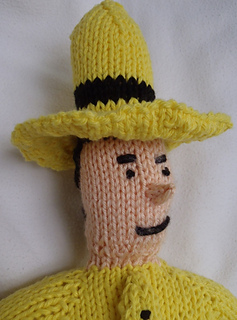 The man with the yellow hat is knitted in the round from top down starting at the neck. The stitches for arms are left on stitch holders and worked at later time. Working on the body and finishing at the legs. Stitches for arms are picked up and worked from top down. The direction for hands are for the thumbs pointing towards body, palms facing back, if you would like the thumb pointing up and palm facing front add half round between R 28 and R 29. The head is attached by picking up stitches around the neck, finishing at the top of the hat. 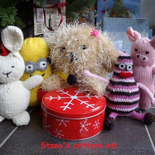 The nose is knitted directly onto face by picking up stitches. The tie is attached to the neck. If you think your tie is too short, add extra few rounds in the straight section. Also stuff his upper body and arms only lightly to prevent his arms sticking out too far. To make the head stand up more and not be too wobbly insert pipe cleaners to stiffen up the neck. When casting on allow for extra yarn to be used for sewing. 150 – 170 yards / 137 – 155.5 meters yellow yarn. 30 – 40 yards/ 27.5 - 37 meters brown yarn. 20 – 30 yards/ 18 – 27.5 meters black yarn. 30 – 40 yards/ 27.5 - 37 meters flesh color yarn.